• Buy one and get one FREE! • 2009 Barack Obama Tribute coin. Buy one and get one FREE! 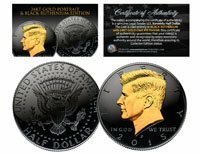 Here is your chance to own or gift a 24KT Gold Plated non-monetary 2009 BARACK OBAMA Tribute coin, privately minted by the Merrick Mint. This 24KT Gold Plated tribute coin boasts great detail and is a lifetime keepsake. Each coin comes in a coin capsule with a Certificate of Authenticity. The coin is designed similar to the JFK Kennedy Half Dollar featuring a left portrait of Barack Obama design on the obverse and a modified presidential seal design on the reverse.